. Google Sites is an easy-to-use online application to make team websites. Multiple users can collaborate on editing the site at once online, and it's all hosted by Google for free. Once you set up Analytics for your Google Site website, you'll have to remember to apply the code to all the existing and future pages for your website. 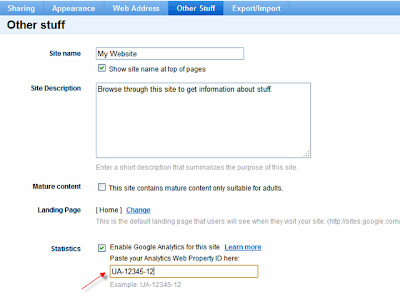 For full instructions on configuring your site with Analytics, please follow these instructions. It only makes sense that Analytics should be able to track sites created by another Google product, Google Sites. Google Sites is an easy-to-use online application to make team websites. Multiple users can collaborate on editing the site at once online, and it's all hosted by Google for free.